Michael’s presentation served as the Friedman JCC’s first formal program. Read coverage of the event here. Tremendous event in Kingston! 100% worth it! Thank you @smerconish! "Michael was largely unknown to our programing committee, but at the request of the board chair, he was booked for a mid-season speaking engagement. To our delight, he was indeed well-known by a great many of our some 1200 diverse business leaders and community members… the turnout was beyond expectation. Spot and follow-up feedback includes: “Powerful”, “Personable”, “Refreshing”, “Balanced”, “Great grasp of current events”, “Those who didn’t attend will regret”, “We should have him back”, “Pragmatic”, “Honest”, “Best of year”, “Quite Relevant”… just to share a few. This is high praise given the range of speakers we enjoy from year-to-year, including former Presidents to Prime Ministers, superstar athletes to principal entertainers, renowned economists to political pundits, or global figures to hometown heroes. Success!" "From Michael's show on CNN, I’ve come to respect that honesty is his stock-in-trade. 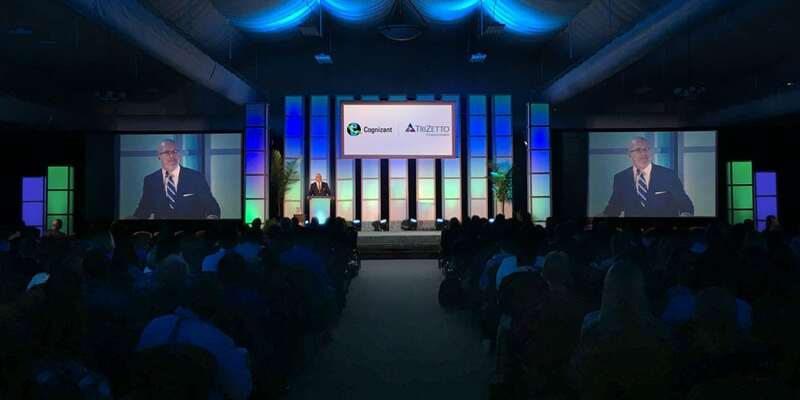 While this integrity was certainly on display in his presentation, I think our more than 500 guests were as impressed with with his energy, humor, and insight." Thanks Michael for a great show last night! I thoroughly enjoyed it. "Michael delivered a riveting keynote to a packed house of investment management/financial service professionals at our Philadelphia Fund Alliance Gala. His unique balance of humor and political reflection kept everyone laughing and engaged. In addition, his exceptional storytelling captivated our audience and was a true treat to experience. We look forward to having him back!" "It was an excellent presentation, and very professionally organized! I appreciated the passion, honesty and digression in the Q and A as well!" @smerconish I drove 5 hours to see you tonight in Houston, and it was worth every mile! Thanks for putting your persona into a relatable thoughtful man! "Thanks for an engaging and energetic session in Vail. I, along with several colleagues and guests, greatly appreciated your extensive insight and perspective of Washington, as well as your interactions with folks outside of the Beltway. We also valued the candor and transparency you used in your detailed answers to our questions." What a terrific speech by @smerconish tonight @GlobalPhila World Heritage City Celebration with @WidenerUniv colleagues and alums. Entertaining, insightful, thought-provoking... @smerconish remarks made me proud to be from #globalphilly #worldheritagecity My hometown! Michael delivering a commencement address on May 19, 2018 at Delaware Valley University, where he was awarded a Doctor of Humane Letters. "We appreciated Michael's balanced approach to discussing topics relevant to all of us in the audience. His well informed and insightful perspectives on the issues of the day were both interesting and thought-provoking. Michael has the unique ability to educate and entertain at the same time. His experience as a radio host, columnist, author, and lawyer was evident during his talk with us. Truly refreshing and a highlight of our 125th annual convention at the Greenbrier." Todd Clossin | 2017-18 Chairman of the West Virginia Bankers Association; President & CEO, WesBanco Bank Inc.
Michael Smerconish in 2018 at the launch of New Way California, an initiative by former California Gov. Arnold Schwarzenegger to reinvigorate the state’s Republican party. You can watch his full speech here. "Michael was equal parts entertaining and insightful as he spoke on personal reflections and critical observations on the state of American politics. As the opening keynote for our user conference, Michael demonstrated the real casualty of hyper partisanship to be our capacity for critical thought, and our willingness to place personal conviction over political advantage. Our audience was engaged and delighted to hear Michael speak, and we would definitely have him back at a future event." "Michael spoke at our MHA Annual Meeting, with hospital and healthcare executives from across the state of Michigan. Our attendees found him to be wonderfully engaging, truly insightful, and highly entertaining. His remarks were very helpful to us as we seek to understand the realities of the evolving culture and political domain, and apply those learnings to our work. Bottom line - Michael was a big hit with our group and we hope to have him back." I want to compliment @smerconish for his appearance at the @paleycenter on Saturday, June 23. He had been awake a long time by then but patiently signed his new book for over an hour after his presentation and Q&A. The kind of guy you want to have a beer with and just talk. "Michael was an engaging and humble speaker. Witty, too. And he was a delight to work with. The night was everything we hoped for and more. The best word that describes Michael is Mensch!" Coinciding with the release of his book, Clowns to the Left of Me, Jokers to the Right: American Life in Columns, Michael spoke to a packed house at the Free Library of Philadelphia for one of their Author Events. Indiana's Herald Times Online writes "Talk show host Smerconish: Maybe we're not so divided, after all." "We were looking for a refreshing, fresh perspective on America's political culture and that is what we got! Michael spoke at the FORUM at BIG ARTS last night to a sell out crowd with numerous disappointed folks who couldn't get a seat. His challenging, thought provoking message wrapped in humor and supported with (real) facts was everything we could hope for! Thanks for joining us Michael! Come back soon!" Great night @smerconish in D.C. My gf’s first experience after hearing me talk about his show. We were so engaged in conversation after the show we made it back home before we realized she met me at work 2 drive in! Worth the xtra drive time-she already ordered his book! Michael’s commencement speech on December 21, 2017 at Temple University’s Klein College of Media and Communication. "Michael appeared at our ideas conference, ThinkFest, and his talk was the highlight of the day. His speech was eye-opening and entertaining, and his message – about how we became so divided and what we can do about it – is one I wish everyone in America, whether their politics are left, right or center, could hear. Michael was smart, funny and passionate, and we got a great response from our audience." 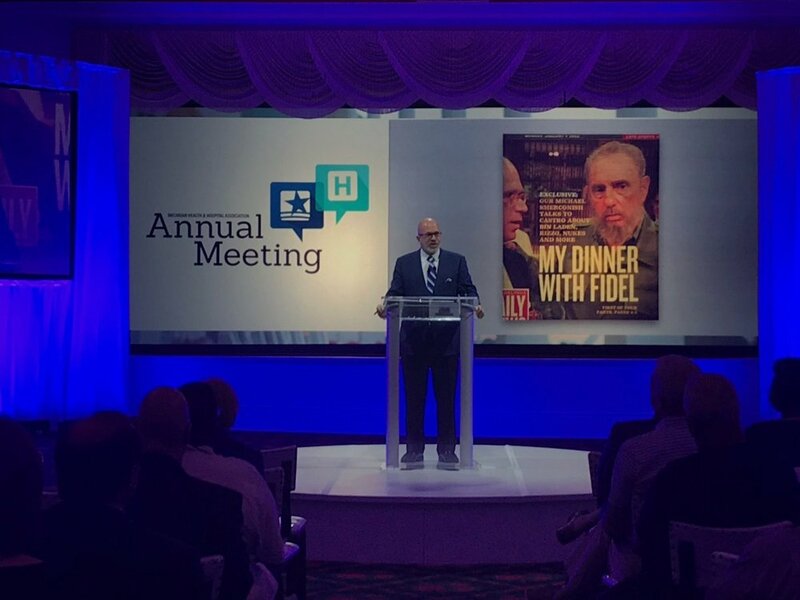 "Michael Smerconish was the keynote speaker at our annual Healthcare Summit in Philadelphia. His address was professionally, informative, and topical. He is an engaging speaker and approachable. Audience feedback was very positive. I would recommend Michael to anyone considering an event speaker." "Michael spoke at the Walkers Fundamentals Seminar in New York, addressing several hundred asset management professionals. Michael was dynamic, engaging and straight to the point. He presented a well researched view of the divisions in society and managed to be both balanced and extremely passionate at the same time. The audience raved." "Michael spoke at our client event last night, and it was a huge success. His comments were entertaining, enlightening, and timely. He managed to present a picture of the current political environment without alienating people on either side of the political spectrum. Michael also took the time to engage with our guests before and after his prepared remarks. People left the event feeling like they gained some new perspectives on politics in the US and were entertained along the way. Having Michael at our event helped us strengthen relationships with existing clients and will hopefully open the doors to some new relationships as well." "Phila EO Group had Michael as their keynote for their recent member recruiting event in Philadelphia. EO is a group of local business owners, and we needed Michael to present a balanced program that would interest all sides. And he did. His talk on the great party divide, what causes it and what can be done about it, was balanced and informative. Members commented on the amount of insider information shared by Michael, and it gave them a clearer understanding of the power that drives the government. Michael was also very generous with his time answering follow up questions, and even posing for individual pictures. Thanks again Michael for a fantastic evening." "Michael was the keynote speaker for our 2017 Annual Conference & Expo in Las Vegas, NV in early October and kicked off our event. Our attendees were excited to hear from him and to say that Michael exceeded expectations is an understatement. His delivery was flawless, energetic and entertaining. His synthesis and illustration of the substantial issues that confront our country were compelling and, as promised, refreshingly independent. Michael basically articulated what everyone was thinking. We have hosted many high profile speakers over our 30 years of Conferences but none have provided such straightforward insight in such an easily engaging and humorous style. We would have listened for several more hours had circumstances allowed." "The evaluation results for Mr. Smerconish’s presentation were exceptional. Our members were attentive and engaged throughout his speech due to his innate ability to resonate and connect with the audience. His impartial perspective, relevant observations, and personal experiences provided a compelling analysis of our country’s political landscape. And as an added bonus, he even offered persuasive ideas as to what we can do to make the system work again. It was a “grand slam” event thanks to Mr. Smerconish’s presentation. A quote by an attendee sums up the sentiments of the audience -- “He was fabulous and I could have listened to him forever." "With so many conferences being offered, the decision isn't always about the budget, but your ROI! That ROI is multiplied when you attend and/or produce a conference that has a line-up of keynote speakers to inspire, inform, and energize. That's what Washington Speakers Bureau provided with Michael Smerconish for our annual conference. Michael was not only a dynamic speaker but also an engaging personality and very well received by all. He took time for photos with our attendees too as well as book signing and commentary. He was exceptional in every way." "Michael delivered the Howard Steele lecture at the 2017 annual meeting of the Scoliosis Research Society. The lecture is endowed to invite a speaker on a topic outside of medicine. Smerconish delivered beyond our wildest expectations. To an audience of 1000, many whom are critical reviewers and deliver many speeches, all were glued to the speaker and the message. It speaks to Michael’s style - comfortable, immensely knowledgable , humorous and engaging. He defined the problem, presented data as well as charming anecdotes, and offered some potential solutions. The grade: A+." “We highly recommend Smerconish for a fair and balanced view of the political divide that is the U.S.A. today." 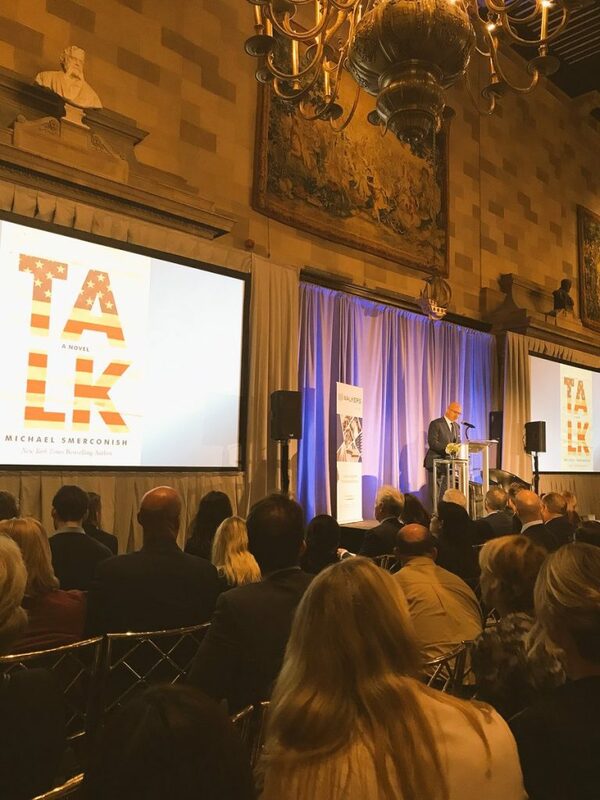 "I conducted an interview with Michael Smerconish before a packed crowd of Lehigh University alumni in Philadelphia City Hall. Our topic was timely and important: the 2016 U.S. presidential election, then less than eight weeks away. Michael, of course, provided expert commentary and insight. But he provided much more. He offered the audience in-depth historical perspectives into U.S. politics and social life. He offered wonderful, personal anecdotes into his own life and times in American politics. And, in the questions and answers that followed, he connected with the audience with such warmth, humor and generosity that I felt we all were gathered together in a family living room. I began and ended the interview with the same sentiment: Michael Smerconish represents the best in American journalism." "Just two weeks prior to the 2016 national elections, our C-suite audience was excited to get the perspectives of Michael Smerconish. He did not disappoint! Michael provided an impassioned and reasoned point of view on today’s political environment bolstered by fascinating sociological insights on how we got here. At a time when talking heads are hell-bent on polarizing, we heard from a thinker who knows his audience and understands what shapes public perception and opinion. In so doing, Michael shined a light on potential paths back to more productive dialogue and legislative action. This was the perfect way to set the stage for our conference!" "As the only trade association in Washington comprised of the top-ranking officials in corporate government affairs offices, the Business-Government Relations Council (B-GRC) serves as a networking platform for our members to share insights into how key decision-makers operate at the intersection of public policy and the political process. As the closing speaker of our 50th anniversary annual meeting, Michael engaged our membership in a dialogue that took us far beyond the headlines to a keen understanding of all of the dynamics at play in the 2016 electoral season -- political, media/technology, demographic -- all grounded in rich, fact-based historical context. The Smerconish hallmark sincerity, objectivity and humor were in abundant supply at our annual meeting - just as they are on television, radio and in print. As it becomes harder and harder to find straight shooters who see the problems our country faces from both sides, thinkers like Michael Smerconish are an increasingly rare commodity every organization should seek out." Michael Smerconish was conferred a Doctorate of Humane Letters by Widener University on May 21, 2016 and delivered the commencement address. "Thanks to Michael Smerconish for a powerful, educational and transformative presentation! I have received comments that this was the best PAC speech ever! "I could have listened to Michael the whole night." "I didn't want it to end," etc., etc. "Michael Smerconish is unique among today's political pundits. In a world where polarizing, thoughtless sound bytes dominate the political landscape, Smerconish is a thoughtful commentator who understands that the divisive nature of today's media has in large measure contributed to the dysfunction of contemporary American politics. I recently had the privilege of hearing Michael Smerconish speak before a group of political scientists. His talk was something we don't usually see these days: a solid argument based on "evidence" presented through polling data, charts, pictures and, of course, his words. He built a strong case about what his wrong with today's politics, but also offered some solid ideas about how we can make the process work again. He held the attention of a group of academics through a thoughtful, compelling, yet entertaining analysis of our today's political scene. If you get the chance to hear him speak, seize the opportunity." "The speaking circuit is overrun with political pundits, but in Michael Smerconish audiences will be struck by a rare combination of carefully crafted storytelling, compelling and accessible polling data, and a powerful, beautifully organized and delivered indictment of today’s media-stoked dysfunction in American politics. At our recent annual meeting, I watched the early morning crowd listen raptly as he laid out his case with thoughtfully chosen charts, pictures, and words, as you would expect from such a talented student of communications, policy, and human behavior. He delivered a grand slam presentation." "Incisive and witty. Michael Smerconish’s diagnosis for what ails the current political system and his prescription for making it healthy again were right on the mark. He is the perfect speaker, especially for organizations involved in advocacy or public policy issues." Pete Ruane | President & CEO, American Road & Transportation Builders Association, Washington, D.C.
“The Carolinas Credit Union League wanted an unparalleled experience at our 2015 Annual Meeting, including a full day of speakers. With a 2.5-hour block on politics and advocacy, it was important that we begin strongly. From introductory video to his final response during Q&A, Michael Smerconish delivered. His expert perspective and direct, entertaining style brought and kept attention on what often is a starchy, analytical, and polarizing subject. Michael’s material was up-to-the-minute and showed he thought as much our audience and bringing them together as we did of his insight. "As this year’s program chairman, for our Annual Dinner speaker, the non-partisan political organization, TIGER BAY of Volusia County (FL), I couldn’t have been more pleased than with Michael Smerconish. At the cocktail party, before the meeting started, Michael was very personable and engaging with our members, something they appreciated tremendously. By the time I introduced him, and called him up on the podium, most of the people in the audience felt they already knew him. Michael ranks right at the top of some of the best speakers we’ve had over the last twenty-five years. You can tell what makes him such a terrific orator, is that he really does his homework, knows his material and doesn’t fumble around for words. And, to put the icing on the cake, he’s very humorous as well. For any organization that is looking for a spectacular program, Michael Smerconish can surely fill the bill." "Michael Smerconish served as the closing speaker at our annual convention. He was extremely well-received and provided an engaging and insightful bi-partisan view on the current status of the issues facing our nation and its implications for the future. In addition, he was very easy to work with in the pre-event planning. I would definitely have Michael talk with our members again!" "At the Fall dinner meeting of the Bar Association of Lehigh County, our guest speaker was Michael Smerconish. Everyone was delighted with his presentation. It was timely, informative, and entertaining. The question and answer session following was lively, fun and the best we have had in recent memory. Before, during, and after the event, Mr. Smerconish was very accommodating and personable. Everyone was left wanting more." "Michael Smerconish was very well-received at our event in Chicago earlier this month. In terms of content, he is a master of weaving together big ideas and down-to-earth examples. As for delivery, he is everything you would hope for from a talk radio guy: articulate and silver-tongued. He was easy to work with onsite, and our audience found his remarks insightful and entertaining." "Michael made an excellent presentation at our Annual Board Meeting. He was extremely well-received. His thoughtful, timely, and relevant presentation kept everyone's attention. His warm and personal insights offered during his comments were enjoyed by all." Gregory Coda | President, Client Management, Munich Reinsurance America, Inc.
"Smerconish was fresh, entertaining and engaging. A genuine storyteller who connected with our audience from start to finish, Michael walked our audience behind the scenes of the media, between the aisles of Washington and into the everyday life of Michael Smerconish. We walked away with a better understanding of the polarizing views dividing our nation and a deeper appreciation that not every issue has to be black and white, us versus them. Most of all, we discovered that the simple conversational things about our lives are what matter most and make for the most interesting dialogue. Our attendees have seen many keynotes, and we wanted to give them something slightly different, something they haven’t seen or heard before. Michael gave us all of that and more. As a result, both NASCO and Michael have expanded our fan base." "Michael was able to address a diverse group of senior executives and directors on current U.S. politics in a very candid and direct way. His views are clearly well informed, and perhaps more importantly, heartfelt, and authentic. Great job…"
"Michael delivered an insightful 45-minute speech about the current U.S. political environment that enthralled our partners and clients. Michael was outstanding in the Q&A session as well, engaging our audience in an array of current relevant political topics. We will have him back!" “Michael spoke at our monthly breakfast briefing on the upcoming election, how it reflects the increasingly polarized state of U.S. politics today, and the root causes of this polarization. Our audience is primarily made up of merger & acquisition professionals, including people in private equity, investment banking, commercial banking, accounting and law. A decent portion of our audience inevitably is disappointed when we have people speak on politics, because the speaker usually leans one way or the other politically. Michael, however, was a breath of fresh air! Not only did he explain the current polarization in a bipartisan manner, perhaps of more import, he did so with an up-tempo, engaging and humorous delivery. I received many compliments from our members, who are typically hard to please, and would heartily recommend Michael for anyone considering an event speaker." "Michael Smerconish served up an outstanding keynote for our Villanova Business Leaders Forum. He was engaging throughout - a perfect blend of humor and analysis to provide his perspective on the increasingly partisan political landscape. The talk was fantastically well-received, without exception, by audience members representing the full range of political orientations - a feat unto itself. Perhaps no less important, Michael was a gracious and thoughtful guest. He spent considerable time and effort understanding our event and making it special. An all-around home run!" "Michael spoke as part of a panel of experts regarding "The Impact of the Economy on the Presidential Election". His comments were insightful, provocative, and timely. Our students, faculty, alumni and corporate leaders in attendance were in agreement that Michael's comments were enlightening and entertaining. He generated thoughtful questions from the audience which only enhanced the quality of the evening. The comments from all in attendance were overwhelmingly positive. They didn't want the evening to end.Thank you Michael, job well done !!!" "Michael spoke at our Annual Conference & Expo, to an audience of homeowners and managers in condo and homeowner associations. His speech focused on the polarization in politics and the increasing lack of civil discourse in America. Our audience loved Michael's presentation and found it extremely relevant to their every day experiences. One of our attendees called his speech "Absolutely one of the best keynote addresses I have heard. Intelligent, engaging and thought-provoking." Nothing makes a conference organizer more satisfied than attendees who believe the event was engaging and thought-provoking. Smerconish delivered on all counts."